How does one attach a sleigh bell to a strap? In the late 1800s, most North American bell makers used two types of fasteners: bell pins and rivets. 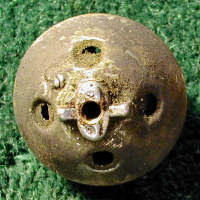 Bell pins were used with "shank" bells, and rivets (or sometimes screws) were used with "rivet" bells. Left: Backside of a bell strap with shank-style bell and figure-8 bell pin. Right: Backside of a bell strap with a rivet-style bell. The dot on the strap is the smooth, flat head of a rivet. To mount a shank-style bell onto a leather strap, the shank is put through an oblong slot cut into the strap. A metal pin bent in a "figure 8" shape is inserted through the hole in the shank and twisted shut (see above, left). This pin locks the bell onto its strap. Left: Old bell with a U-shaped shank. Up to the mid 1800s, most sleigh bells had this type of shank. Middle: Old bell with a drilled shank. In the mid to late 1800s and early 1900s, the shank on many bells was cast as a solid tab. The hole was later drilled through. Right: New bell with a cast circular hole. Most bells made today have a shank like this, although the hole in some modern bells is drilled. 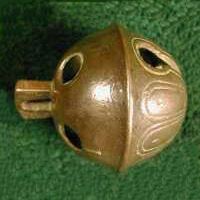 The shank style bell with its hand-made bell pin was expensive to produce. By the mid 1850s, manufacturers began to redesign sleigh bells, so they could be attached to straps more easily and cheaply. Inventors proposed a variety of fasteners, including spring-loaded "T" shaped pins (6), oval split rivets (7), sheet metal clips (8), and staples (3). By the 1870s, steel rivets (4) were widely used to fasten sleigh bells, although one foundry preferred to fasten their bells with small screws. 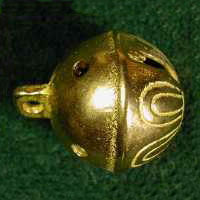 (5) The flat, smooth rivet (or screw) allowed designers to create a wide variety of unusual sleigh bell styles. 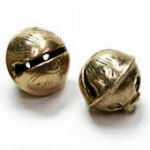 Left: Machine-stamped brass bell with a rivet base. The two prongs on side of the rivet hole bite into the leather strap to keep the bell from rotating. 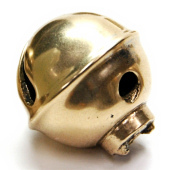 Middle: Cast brass bell with a rivet base. The protrusions around the rivet hole strengthen the base of the bell and keep it from rotating on its strap. 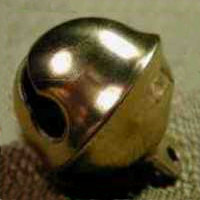 Right: Cast "round ridge" bell with a rivet base. The tall pillar of the base isolates the bell from the leather strap, improving the sound. The rivet goes through a hole drilled or stamped through the base of the bell. 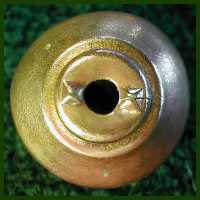 Two to four small pins or prongs usually surround the rivet hole on the base of the bell. These pins bite into the leather to keep the bell from rotating when the bell is fastened onto a strap. Some rivet-style bells today are attached to their strap with aluminum "blind" (aka POP®) rivets. Blind rivets were first patented in 1916, and POP® rivets (a trademarked product of Emhart Teknologies) were widely used in the British aircraft industry during World War II. 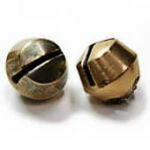 POP® rivets were not commercially available in the U.S. for general use until the 1950s, however. (1) Any American-made bell strap with these rivets can be no older than that. Left: Most "petal" bells were made with a shank base, but one maker produced a line of smaller rivet-style petal bells. 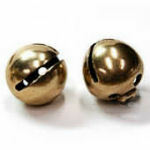 Middle: "Egg" or "globe" bell, a common rivet-style bell. It comes in several variations. 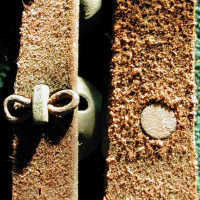 Right: "Band" or "bevel" bell, another common rivet-style bell with several variations. 1. Personal communication with Mick Guy, POP Automotive Process Manager, Emhart Teknologies, 1 May 2003. 2. Gary W. Spickler. Sleigh Bells of New Britain, Connecticut. The Bell Tower. 63:6, Nov.-Dec. 2005, pp 22-25. American Bell Association International, Inc.
3. Abner G. Bevin. Method of attaching sleigh-bells to straps. US Patent 15366, issued May, 1856. 4. L.C. Chase, Mode of Stringing Sleigh-Bells, US Patent 32274, issued May 14, 1874. 5. William E. Barton. Improvement in Attaching Sleigh-Bells to Straps. US Patent 46623, issued March 1865. Reissued US Patent 4185, November 1870. 6. I.H. Abell, Sleigh-Bell Attachment, US Patent 60658, issued Jan. 1, 1867. 7. Ann Harrison, Improvement in Sleigh-Bells, US Patent 147259, issued Feb. 10, 1874. 8. Cyrus R. Clark, Improvement in Sleigh-Bells, US Patent 70526, issued Nov. 5, 1867.